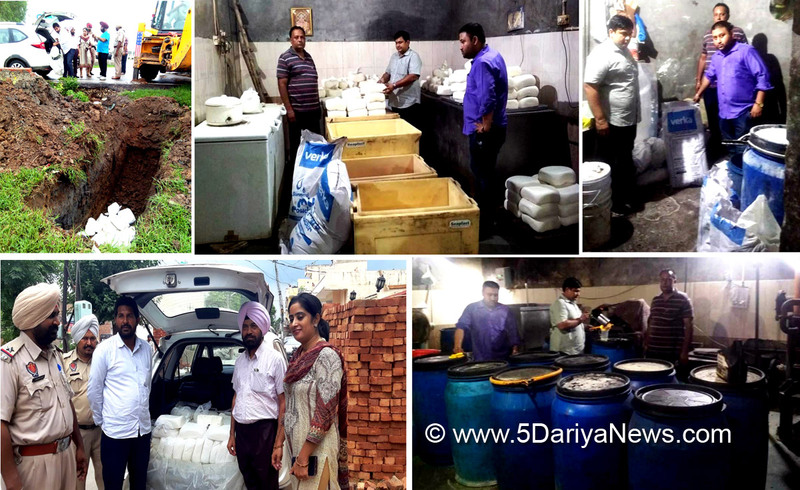 Working on a tip off, Food Safety Team of Ludhiana conducted a raid at a Paneer manufacturing unit in an interior village of Samrala. Huge cache of spurious Milk and Milk Products(M&MP) were seized.Giving details, K.S. Pannu, Commissioner, Food & Drugs Administration, Punjab said,” Around 9:30 pm ,we received an information that huge quantity of spurious paneer was being prepared in a manufacturing unit in Samrala and it was to be dispatched to market at the daybreak. So, immediately springing into action Food Safety Team of Ludhiana conducted a raid at the said premises at around 10 pm.”The Paneer manufacturing unit was run from a house. When the food safety team reached there, the premises of the house/factory was locked from outside but the workers were working there in .With the support of locals the lock was opened and a huge quantity of spurious M&MP was discovered.The entire operation lasted for about 4 hours and a sizeable amount of spurious Milk and Milk Products were seized, including 3 quintals of paneer, 90 litres of palm oil, 5 quintals of ghee , 39 empty Palm oil tins of 15 litres each, 5 sealed palm oil tins of 15 litre capacity each and 13 bags of 25 kg capacity of verka skimmed milk powder and 4 bags of 25 kg each of other skimmed milk powder. Similarly, a raid was conducted in the early morning hours in Jalandhar. A large amount of curd (approximately 2 quintals ) and spurious desi ghee to the tune of 8 quintals was found. 35 packets of Skimmed milk powder were also seized from the spot . Samples of all these along with samples of milk and paneer were taken.In a similar inspection at Mansa 11 samples were taken Including 8 samples of milk and milk products , 3 of milk, 1 of curd, 2 of Khoa and two of Paneer and the further procedure is on.The samples collected from all the raids have been sent for lab analysis.In Rajpura, district Patiala a vehicle carrying about 160 kg of paneer coming from Narwana , in Jind district of Haryana was intercepted by the food safety team. The vehicle was bound for Satgur Dairy in Teacher's Colony in Rajpura. The owner of paneer was Ram Mehar from Narwana who on enquiry disclosed that he sold spurious paneer at Rs.160 /kg to the said dairy in Rajpura. Two samples of paneer were taken and the remaining stock was destroyed on the spot.It is pertinent to mention that it is the second consecutive big seizure by food safety teams who on Thursday had unearthed huge quantities of spurious M&MP seized in Patiala and Moga.